The title of this article is pretty scary. But it isn’t entirely accurate. Pumpkins won’t really rot from the inside out. In this article, I will describe one way in which pumpkins can seem to rot from the inside out. Recently, I was asked to visit a field of pumpkins where the pumpkins were soft and rotting. Some of the pumpkins had already burst. Some were soft and when prodded, the insides flowed out. I set out to try to understand how this could happen. Although it seemed that the rotted pumpkins were healthy on the outside, upon closer examination, I found lesions of bacterial spot on the outside of affected pumpkins. More information about bacterial spot can be found in Vegetable Crops Hotline No. 586. 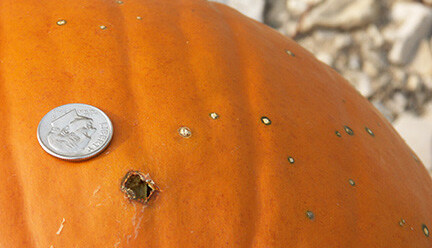 Most lesions of bacterial spot on pumpkin are scab-like on the surface of the pumpkin (see Figure 1). Occasionally, however, such lesions will become infected with secondary organisms such as fungi. When this happens, the lesions may enlarge and cause a rot from the surface of the pumpkin into the interior of the fruit (see Figure 2). 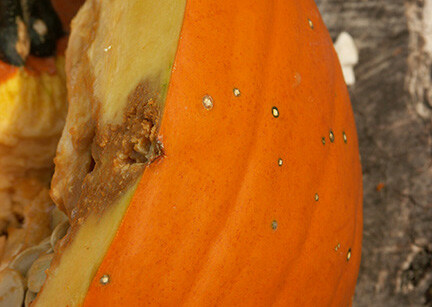 When I examined the pumpkins that appeared to be rotting from the inside out, all of them had holes that started out as bacterial spot lesions. Frequent rains then allowed water to accumulate in the pumpkins. A variety of microorganisms then caused the pumpkin to rot, seemingly from the inside out. To make matters worse, bacterial spot lesions typically occur on the surface of the fruit where rain may easily enter the enlarged lesions. There may, of course, be other reasons why pumpkins appear to rot from the inside out. However, look carefully at such pumpkins to see if small lesions caused by bacterial spot have become large enough to allow water and microorganisms inside the pumpkin, causing a rot. While such pumpkins are awful to behold, they are a little less scary if one understands the cause.